Not far to go now, the little boat is looking very good sitting out there on the piles of stone that form her temporary cradle. There are lots of bronze fitting bolted to the deck, cleats and fairleads , portholes in the cabin sides, ( yes they are odd, they came from Trade Me, New Zealand’s equivalent of EBay, a wonderful source of bits and pieces) There are chainplates and Sampson post pins, winch pads and so on, all bolted down ready for use. From here the boatbuilding gets into much smaller details. 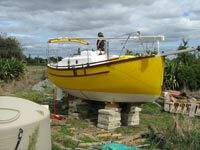 Instead of asking for a hand to lift a 16 ft long 7 x 3inch piece of Kwila up onto the keel (that was HEAVY) or the pair of us grunting on the end of a four part block and tackle to pull a ¾ ton lead casting into place its more about using a dot of sealant to hold the washers on the back of the bolts until a nut can be done up, or visualising the fall of a halyard to get the cleat in the right place. As with every stage of the job the list of things to do seems to grow faster than they are ticked off, but those jobs are getting smaller all the time, and fewer. Right now, the task is to prioritise the jobs into what should be done “here” while the workshop is available, and those that can be done on the hard or in the water at the marina. 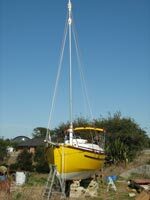 Yes it’s that close gentle readers, the truck has been booked, and we except to see that bright yellow transom head out the gate about the 8th 9th 10th of April and that’s only just over a week away. 2-½ years its been a part of our lives, gradually changing and metamorphicising from a pile of wood that could be anything from firewood (expensive but aromatic) to an ocean capable voyaging home, the culmination of this part of a dream. Among the jobs just done has been the seating of the lead on the wooden deadwood. The procedure was, lift the keel into position, mark out and bore the cross holes for the pocket nuts and then the holes through the lead were extended up to those. Next, the pocket nuts which are pieces of 38mm silicon bronze bar were drilled and tapped and the keel retaining bolts then put in and wound up tight after some emulsified bitumen was painted on the top of the lead. Note that the keelbolts in this boat are not continuous, the bolts from inside run down through the deadwood and are counterbored in flush at the lower end, then the ballast retaining bolts run up to the pocket nuts overlapping the single 7in x 3in piece of kwila that forms the ballast keel seating. 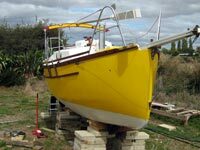 The objective is that should the boat hit something hard the ballast keel bolts may be disturbed but that does not mean the seal between the keelbolts and the inside of the hull are not disturbed. So it’s getting close to launching, maybe two or three weeks! As the designer, I am chewing my nails a bit, all the theory and numbers are right, the design is not anything likely to be a disaster, but it’s a brand new baby and it had better float!